The invitation to what will likely be the corporate bill-mill’s largest fundraiser to date was obtained by Documented. The Center for Media and Democracy (CMD) previously reported that individual tickets to the Gala cost $500, or state delegations can ask lobbyists to sponsor a table for $10,000. ALEC, registered as a tax-exempt 501(c)(3) organization with the Internal Revenue Service, lists an all-GOP group of chairs on the invite, including former Speaker of the House Newt Gingrich, former Virginia Sen. George Allen, U.S. Rep. Cathy McMorris Rodgers (WA-05), supply-side economics evangelist Arthur Laffer, and current ALEC National Chair State Rep. Jason Saine (NC-97). A more recent “Save the Date” sent to members in June, obtained by CMD, shows that 2016 Presidential candidate Carly Fiorina, Nebraska Gov. Pete Ricketts, and former President George W. Bush’s Attorney General John Ashcroft have been added as Honorary Chairs. While it masquerades as a charity, ALEC is actually a powerful corporate-funded pay-to-play group that brings lawmakers, lobbyists, and other right-wing groups together to vote side-by-side on bills that legislators then take back and introduce in their home states, usually without any public disclosure of their source. Common Cause filed an IRS whistleblower complaint against ALEC in 2012, charging the group with tax fraud and massively underreporting its lobbying activity. CMD has since teamed up with Common Cause on several supplements to the complaint, including one in 2016 exposing Exxon’s illegal use of ALEC to promote its climate denial agenda. Indeed, corporate lobbyists may outnumber politicians if the Gala Chairs and Committee list is any indication. Lobbyists for big polluters, Michael Morgan from Koch Companies Public Sector and Ken Freeman from Exxon Mobil, are on the committee, although it is unclear if Freeman will now attend after Exxon dropped out of ALEC last month. Big pharma’s Ken Cole from Pfizer is a Gala Chair and Big tobacco’s Dan Smith from Altria sits on the committee. Grover Norquist, one of the chief architects of the movement to crush unions, is on the committee alongside Chirag Shaw of the Asian American Hotel Owners Association, a group that has fought minimum wage hikes in California. And net neutrality fighters CTIA-The Wireless Association’s Meredith Atwell Baker (Chair) and Charter Communications Marva Johnson (Committee) are also listed. Added as a Chair on the “Save the Date” is Joanna McIntosh from NCTA-The Internet & Television Association. The “Save the Date” also adds Matt Schlapp, chairman of the American Conservative Union to the event committee. While ALEC’s primary focus has been on state legislation for most of the last 45 years, it has become increasingly involved in federal issues of interest to its patrons, such as fighting net neutrality, and many ALEC alumni now serve in Congress and the executive branch. Vice President Mike Pence was a longtime active member of ALEC, and spoke at the group’s 2016 annual meeting. A November 2017 report by Public Citizen found that 44 officials in Trump’s government have close ties to the Koch brothers, prominent players and funders in ALEC. Koch Industries’ director of governmental affairs, Michael Morgan, holds a seat on ALEC’s corporate “advisory” board. 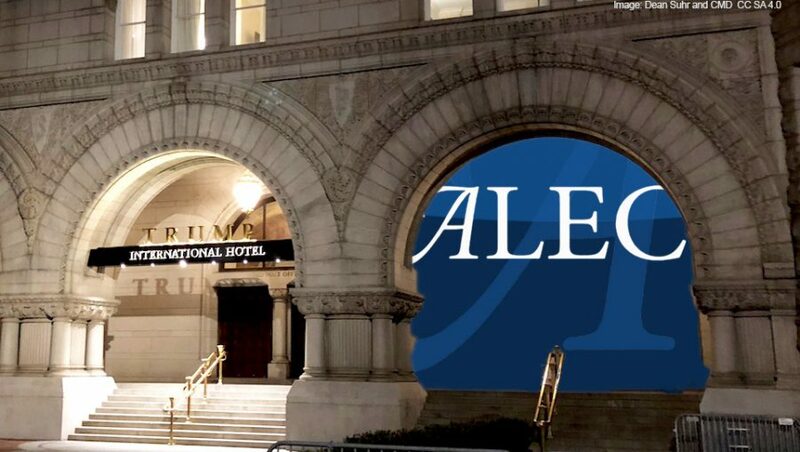 With ALEC hosting its 45th anniversary gala at the 45th president’s premier influence center in the nation’s capital, it would appear that ALEC’s conversion to Trumpism is complete. Arn Pearson is Executive Director of the Center for Media and Democracy. He previously served as the Vice President for Policy and Litigation at Common Cause. Arn has worked for more than 20 years developing federal and state policy and legal strategies around campaign finance reform, government ethics, corporate accountability, and tax reform.